A wonderfully flavoursome smoked British gammon joint. 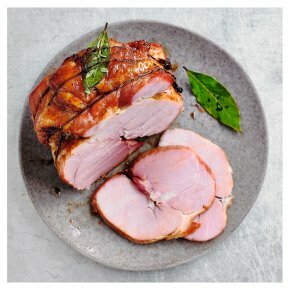 The gammon is hand cured with salt and sugar, then matured slowly, beech smoked and finally covered in a muscovado glaze for a fabulous sweet, caramalised flavour. Delicious served hot or cold, as a main meal or part of a buffet spread. Made of prime British pork, from pigs born outdoors and reared in airy, straw-bedded barns. INGREDIENTS: pork (91%), demerara sugar, salt, water, muscovado sugar, barley malt vinegar, dark rum, honey, concentrated mango juice, concentrated pineapple juice, pork gelatine, cornflour, preservatives (sodium nitrite, potassium nitrate), sea salt, cinnamon, ginger purée, allspice, antioxidant (sodium ascorbate), bay leaf, concentrated lemon juice, thyme.